No matter when you decide to move, it’s a safe bet that someone has already moved themselves. That means they may have a lot of boxes they’re willing to get rid of. The best place to check is on Craigslist or Freecycle. 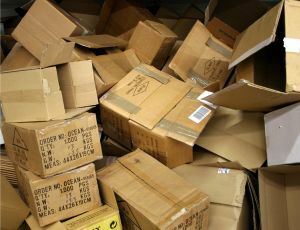 Any grocery store will also have a big supply of cardboard boxes they are willing to turn over to you. You can also put a posting on Facebook to see if anyone’s got boxes in their garage they’re willing to get rid of. The best way to save money on a move is to be flexible. That may take a little coordination between you and your landlord. For instance, if you could get in a few days early at your new apartment, then that might allow you to move on a Tuesday or Wednesday. You can negotiate for lower rates that because most moving companies are fully booked on the weekends. The same can be said for mid-month. If you moving into new home, then you might want to negotiate staying until the middle of the month at your old home for that very purpose. As you go in search of movers you are going to find plenty of options. You can weed out your choices by first checking the reviews. You want to make sure you’re not getting a mover who has a reputation for adding charges on to the move. It’s a common employed to quote you one price and then tack on extra hours due to “unforeseen” circumstances. Don’t ever take an estimate from a mover who doesn’t come to inspect your stuff. That’s where you get into big trouble especially with the size of the truck. Movers charge by the hour. They also can charge by the amount of boxes they’re moving. In either scenario, you want to minimize the expense. That means not moving with clutter. As you pack up your stuff, you’re sure to fine plenty of things that you can do without. None of that should come with you to your new home. Junk King Sacramento can take care that with one phone call. These are the junk hauling experts that will not only clear out your home of all its unwanted clutter but also find a responsible place to dispose of it. Don’t make a move to a new home without involving Junk King Sacramento. This entry was posted in Sacramento Junk Hauling and tagged junk king sacramento, junk removal, next move on June 30, 2017 by Junk King. Last updated July 1, 2017 .